American Turbine manufactures a kit that converts a Jacuzzi 12YJ or Golden Eagle axial flow (low pressure) pump to a much more efficient MIXED FLOW (high pressure) pump. The ENERGIZER KIT will yield the same speed or better at a LOWER RPM. Four original Jacuzzi parts are retained: bearing cap, suction housing, inspection cover, and the transom housing. On average there is a 20 percent increase in performance with the Energizer Kit over the original 12YJ pump. 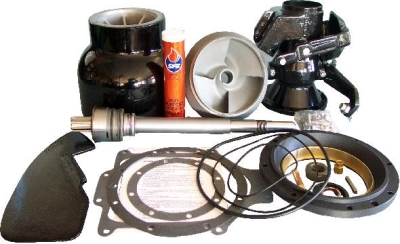 Parts for the Energizer Kit are much cheaper than original Jacuzzi 12YJ parts.